Change is a very difficult thing. Even if you want it and are ready for it, you may not fully embrace it when it finally arrives. That’s what we are experiencing right now as the Obama administration begins to wind down and the forces that have resisted his initiatives begin gearing up their campaigns in an effort to turn back the clock and undo what cannot be undone. I usually don’t write about partisan things. Because when it comes to community building, political parties don’t really have much to add to compelling conversations emerging from the front lines of change. Change comes from a community’s ability to look at its reflection from the streets and places they are creating throughout the US. Places where they have raised families, where they themselves were raised. Where they studied and played and where they learned about building a culture of prevention around health and global climate change. These are the things that come together to create community. And when I refer to community building, I am talking about how individual neighborhoods act with agency despite the dearth of help from outsiders as they go about the work of laying down roots, forming families, establishing durable social networks that will withstand generations. I refer to place-making where they argue the merits or disadvantages of many things and make difficult decisions on issues that could disrupt their sense of community. Spaces, both physical and symbolic, where they must come up with strategies to deal with how they and their neighbors will weather economic storms, or even how they all will enjoy a sun splashed Sunday afternoon in the park. All of this is community building. And much more. Last week, we observed the official Columbus Day holiday, and, as I was heading for a coffee, I heard a piece on local public radio discussing how the Koch brothers have decided that in order to penetrate the Hispanic community with their anti-Obama ideology they will have to borrow a page from the labor movement. The Labor Movement! They will have to hire community organizers to go out and try to tap into the narrative of community building collaboratives and networks at work in some Latino neighborhoods for over a hundred years. It is a not-so-subtle effort to shift the conversation from community building to how their freedoms are being threatened by the last eight years of life under the first “community organizer” President. At first, I thought it was a joke, or that maybe it was too early and I did not hear it correctly. But no, that’s exactly what they were talking about. They went on to report that there is even an umbrella organization called LIBRE, headed by an honest to goodness Mexican-American, to help Hispanics understand how the policies of Donald Trump, Ted Cruz, Mike Huckabee and the good doctor, Ben Carson are better for Latinos making their way into the American mainstream. In my last column I wrote about how social capital is the currency of community building and empowerment in emerging communities throughout the US. Especially if it is coalesced into collaboratives that seek to disrupt and moderate the march forward of issues like gentrification and global warming. But what I did not mention is that social capital can be tapped by anyone for whatever ends. Social capital is like any other currency. It possesses neither political ideology nor moral compass. It is there for the taking. So basically, the Koch brothers would like Latinos to spend their social capital on helping them undo Obama’s policies of the past eight years. 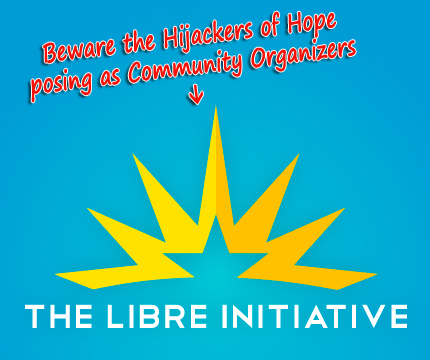 I went to the LIBRE website and sure enough, there it was, a grassroots, community building conference in a working class neighborhood of Las Vegas headlined by community organizer, Senator Marco Rubio. We have to be careful that the community building narratives that have been gaining momentum just below the radar and that are now moving to scale by media accounts purchased with social capital, are not hijacked and turned into another side show by the Fox News political circus. I don’t see community building as a tool for carrying out political exigencies of either the right or the left. Community building is not driven by ideology or political party but rather on what is and isn’t good for neighborhoods and the families that comprise those neighborhoods as they make their way into the mainstream of American life. It is serious business, and I believe will be the difference between success and failure for scores of Latino communities across the US. It is at the core of the New American Dream. Not the American Dream as defined by a post WW II baby boom, or an economic boom driven by a thriving military industrial complex, nor a worldview filtered through the obsolete Cold War narrative. Or an ideology rooted in trickle-down economics that had at its core unprecedented military build-up offset by deep cuts to social spending in health, education and infrastructure with the remainder relegated to a bloating deficit for future generations to sort out. That was the thinking behind our entrance into the Iraq war. That last adventure nearly caused the collapse of our financial system, threatening our way of life. Unchecked, it could have destroyed the American Dream for everyone, forever. The new American Dream is being re-imagined and redefined in new colors reflecting a new multicultural reality and inclusive identity. Opportunity is defined by a robust economic engine driven by socially conscience entrepreneurs who are reshaping the landscape of business and consumer behavior in the fields of healthcare innovation, energy sustainability, entertainment, multi-platform communications, mobility and the built environment, sustainable place-making, education and ed-technology, and on and on. It is a new America with the super power audacity to elect its first black President at the dawn of the 21st century. It is a story of an America that continues to prosper and gain in strength both domestically and globally. It continues to question and challenge its past while pushing with hopeful vigor toward a brighter future. Let’s remember that it was young people who entered the political process to make this happen. They didn’t do so because their parents were Republicans or Democrats. They joined the movement to elect Obama because his momentum was born in community organizing and it was time for America to change. You see, as a nation, our best days are not behind us. Our best days are yet to come. The boldest ideology for the new millennium is that change comes from the bottom, the grassroots, and makes its way to the highest places. Not allowing valuable social capital to be hijacked by the past is essential to keeping that concept moving forward. Every young person who has come of age during the past eight years knows this. It is encoded into their collective DNA. I have faith that these same young people will have the presence of mind to remain libre when LIBRE comes knocking with false prophecies that subtly obligate our youth to dial down their expectations for a more hopeful and expansive future.